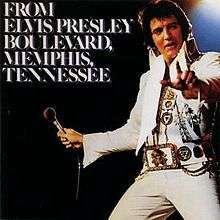 From Elvis Presley Boulevard, Memphis, Tennessee is an album by Elvis Presley, released on May 16, 1976 on RCA Records. According to Sony music's "Elvis The Music" site, the album was released on May 17th. Since music at this time period was normally released on Monday's...it is believed that the May 16th date is more accurate. It is often mistaken that this is a concert recording as the album states the songs were "recorded live". While this is true, the songs were recorded live in the recording studio at a studio set up in Presley's mansion, Graceland, not in front of an audience. Two songs recorded during the session, "Moody Blue" and "She Thinks I Still Care" would be released the following year on his final album, Moody Blue. From Elvis Presley Boulevard, Memphis, Tennessee was the Presley's fourth album to reach #1 on the Billboard country music album sales chart within the last four years. "Hurt" was a top 10 hit on both the country and adult contemporary charts, while "For the Heart" stalled at #45 on the country charts. The latter did make the pop top 30. Both songs would again find success on the country charts in the '80s – "For the Heart" became the first single for the Judds in 1983, while Juice Newton took her version of "Hurt" to #1 in 1986. From Elvis Presley Boulevard, Memphis, Tennessee was certified Gold on October 10, 1977 by the RIAA. In 2000 the album's tracks were added to Moody Blue to create an expanded 19-track CD of the latter title. In 2000 a two-disc edition of From Elvis Presley Boulevard, Memphis, Tennessee was issued on the "Follow That Dream" label. 3. "Blue Eyes Crying In The Rain"
7. "Bitter They Are, Harder They Fall"
10. "I'll Never Fall In Love Again"
Elvis Presley - vocals, guitars, bass on "Blue Eyes Crying In The Rain"
↑ Simpson, Paul (2004). The Rough Guide to Elvis. London: Rough Guides. p. 151. ISBN 1-84353-417-7. ↑ "From Elvis Presley Boulevard, Memphis, Tennessee". Elvis - The Music. Sony Music Entertainment. 2015. Retrieved January 14, 2015. 1 2 "From Elvis Presley Boulevard, Memphis, Tennessee". Elvis Presley shop. For Elvis Fans Only / Elvis Australia. 2014. Retrieved January 14, 2015. ↑ "Elvis Presley Albums". Softshoe-slim.com. Retrieved February 16, 2012. ↑ "Sitemap". Elvis.com. Retrieved 2012-02-16.